Well, the Desiring God conference (see last blog post) went great. It was a real blessing. You know how lots of times most people refer to their church service schedule as "worship, and then the sermon", as if worship only consisted in singing songs and not in hearing the living and active Word of God preached? Well, as you can tell from the way I worded that last sentence, I hate that false dichotomy. It is all worship. There is worship in the singing of psalms, hymns, and spiritual songs, and then there is the worship of hearing the preaching of God's Word. 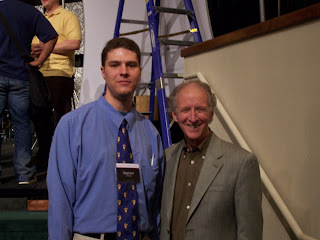 Anyway, I say all of this because listening to John Piper's sermons this weekend in Austin was a very worshipful experience. As he talked about Job's suffering and God's sovereignty over all things, there were so many glorious truths brought out that made my soul shout within me "Thank you, Lord! Thank you for your mercy! Thank you for being so valuable! Thank you for your wisdom!" All of the sessions from the conference are already available at DesiringGod.org in written, audio, and video formats. Check them out! It is all very encouraging to the soul.